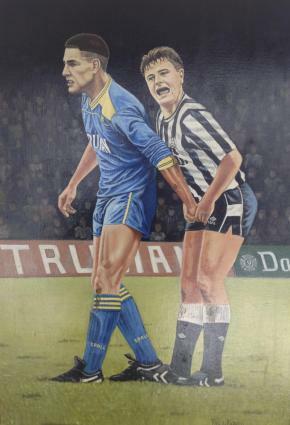 In its exclusive coverstar interview, football hardman turned Hollywood actor, Vinnie Jones, revealed he has an oil painting hanging in the hallway of his Los Angeles mansion, depicting the infamous moment he grabbed Paul Gascoigne by the testicles in 1988 while playing for Wimbledon against Newcastle. When asked whether he still remembers the outrageous foul, Mr Jones was his typically candid self: “That photo is one of the most recognisable moments in football, and is the one that most fans ask me to autograph. I played well in that game, and wanted something to remember it by. It did not take long for the major tabloids to pick up on the interview, with both the Daily Mirror and Daily Express publishing the story on their websites to a combined 101 million unique visitors each month, giving the CALIBRE brand unprecedented coverage. As well as being featured in some of the UK’s most popular newspapers the story also gained international traction in Ireland with The Irish Mirror, in Australia with Yahoo Australia, and also across large swathes of the Canadian press. ‹ CALIBRE Quarterly Issue #9 On Sale Now!